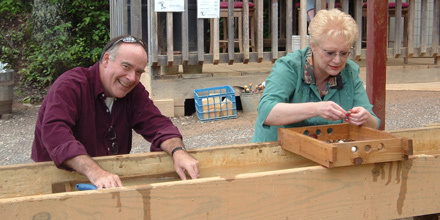 Gem mining has been a favorite activity for visitors to the Franklin, NC area for years. As you read on you'll discover our heritage as "Gem Capital of the World" as well as how to mine, what to look for as you mine and complete descriptions of active mines in the greater Franklin area! 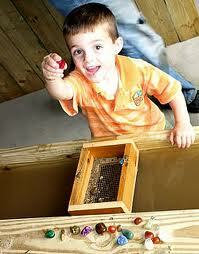 Most mines sell gem dirt in a bucket or bag (few allow digging) and you may have to pay an admission fee for the day. You are provided with a screen for washing and there is a flume - a trough of running water - with a bench along it's length. The dirt goes in the screen, the screen goes in the water and the mud is washed away. Well, it's not quite that easy but it is completely safe and mine operators are on hand to help with technique and identification. The "3 c's" of gem mining are Color, Clarity and Crystals. Gemstones come in every color from white to black. Garnets are glassy red , pink or reddish brown. Rubies are silky red, sapphires are every other color, and both have a crystal formation with 6 sides. Moonstones are pearly white to gray and peach to chocolate brown with a flat box-like shape. Quartz comes in many forms, sometimes clear colors like Amethyst and Citrine, sometimes opaque colors with mica flecks like Aventurine and of course clear with sides - quartz crystals. That's just a few of the many gemstones found at local mines. Stop in at one of the many gem shops for a crash course in gem identification or spend some time at The Franklin Gem & Mineral Museum in the old jailhouse on Phillips Street in historic downtown Franklin. (Native Only) Come enjoy the fresh mountain air, natural creek water running through the flume line and the scenic beauty of Cowee Valley. The mine is not "salted" or "enriched" and contains only native North Carolina gemstones, including Rubies, Sapphires, Garnets, Moonstones, Rhodolite, Rutile and Sillimanite. These gems occur naturally in the Cowee Valley and are not as plentiful as in "salted" mines, but are much more valuable and many are "facet quality". Helper's will be glad to help you identify your gems. The CHEROKEE CHIEF RUBY was found here in 1993. This huge gem quality ruby had a total weight of 1070 carats. Located 4 miles north of Franklin at the foot of Cowee Mountain just off Highway 441,, Cowee Mountain Ruby Mine is open 7 days a week from 9:00 a.m. until "The Last Person Leaves". Two covered flumes allow you to mine rain or shine. Mining instructions for the novice on premises. Free Admission. Refreshing picnic area by shade trees & running brook. Cold drinks and snacks are available in the gem shop. Buses, large or small groups welcome. Group rates are available for groups of 15 or more. Gem dirt to go is available all year. Family owned and operated. LOCATION: 6771 Sylva Road, 828.369.5271. Open 7 days a week at 9AM, rain or shine, covered flume - conveniently located on Hwy 441. Colorful gems in every bucket! All equipment provided. Assistance to identify gems; custom gemstone cutting; gemologist on premises. Picnic area with restroom, soft drinks. Gem dirt to go! Group Discounts. Opal buckets available. Gift & Rock Shop. (Native Only) Under new management. This mine has an abundance of beautiful sapphires in all colors along with pink and red rubies. It's one of Macon County's oldest and most productive mines. The only mine with a guarantee that all will have success their first time. Dig your own dirt. Open 8a.m. to 5 p.m. 828-369-9742. Located in the Burningtown Community off Route 28 North. Follow signs. (Native and enriched stones) Beautiful native rhodolite garnets, kyanite, pyrope garnets, and quartz along with other added gems. Assistance to beginners and "old timers". Shaded flume, clean restrooms, gift shop and snack bar. LOCATION: 5315 Bryson City Rd., ph. 828.524.4570. Rose Creek Mine Gift & Rock Shop. We have rubies, sapphires, garnets, emeralds and so much more. 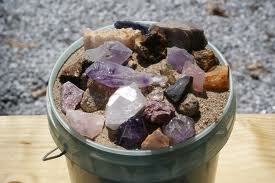 We also have special buckets, gem kits, lapidary supplies, jewelry, Opals and a world class collection of minerals. Last new miner accepted at 4pm. Dig your own dirt, first bucket free with admission. Help for beginners, equipment supplied, covered flume line, clean restrooms, covered picnic tables, snacks. Group rates available as is gem dirt to go. Five miles north of Franklin on Hwy 28, left on Bennett before river. 115 Terrace Ridge Dr. For mining info call 828.349.3774. As featured on the TRAVEL CHANNEL. NATIVE Rubies & Sapphires (some will "STAR") or Enriched Rainbow Buckets with Semi-Precious Gems from around the world. Open 10am-5pm. Admission includes 2 starter buckets. Mine rain or shine at covered flumes. Picnic tables, Snacks & Beverages. Gem Identification. Stone Cutting and Setting available. Gift Shop. Clean Restrooms. Group Discounts. Wire Wrap Classes available. Gem Dirt to Go. Fun for all ages! Relaxing atmosphere, friendly assistance, and all you need to bring is yourself! 385 Sheffield Farms Rd., ph. 828.369.8383. Located 3.5 south of Franklin, NC on Highway 441/23 the Georgia Road. The Gem Factory has used time honored traditions of goldsmithing and stone cutting to create one of a kind jewelry. Their new expanded showrooms have a large variety of jewelry, gemstones, rocks, minerals, carvings, fossils, and gifts in a beautiful nature inspired atmosphere. Come in for a free guide to the mines and free stone inspections. Contact the Martinez Family at 3348 Georgia Road, ph. 828.524.9193. They are one of the oldest and largest gem and mineral shops in the Southeast, with over 50 years collecting and experience, and approximately 5000 sq. ft. of retail and museum space. If you are a rock hound, they are an authorized Graves & Lortone dealer. If you need guidebooks or maps, they have those too. Come by the shop on your way to the mines for your FREE map. For your jewelry needs, the options are endless! There is a huge variety of stones that are cut and ready to be placed in the mounting of your choice, including precious diamonds, amethyst, citrine, tanzanite, sapphires, emeralds, peridot, tourmaline, aquamarine, and more! They have a vast collection of Gold finished jewelry.